The Leaning Pile of Books is a feature where I talk about books I got over the last week – old or new, bought or received for review. Since I hope you will find new books you’re interested in reading in these posts, I try to be as informative as possible. If I can find them, links to excerpts, author’s websites, and places where you can find more information on the book are included. I didn’t buy anything this week, but a few books showed up in the mail. For reviews, I really hoping to get one up last week, but I seem to have a case of reviewer’s block. A couple of nights I came home from work and tried to work on reviews, but it just wasn’t working – even if I knew what I wanted to say, I just couldn’t get it written out. Unfortunately, sometimes that just happens, especially if I don’t have time to write much over the weekend and try to write after work when I’m usually pretty exhausted. I’ll try again this week – both the books I have up to review next are ones I loved so I am excited to talk about them! On to this week’s books. This is one of several of George R. R. Martin’s older books that were recently re-released as trade paperbacks (I’d imagine due to the success of A Song of Ice and Fire). This space opera, written in the late 1970s, was a Hugo nominee. Dying of the Light can also be found in ebook and audiobook, and an excerpt from the novel is available. I’m really excited to read this one, both because it sounds really intriguing and because it will be interesting to read science fiction by George R. R. Martin (I’ve not read any of his work not related to A Song of Ice and Fire). 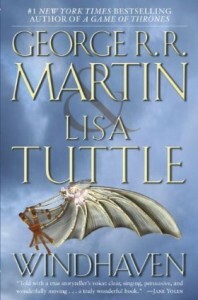 This is another one of the recently re-released trade paperback editions of George R. R. Martin’s older titles (co-written with Lisa Tuttle). Windhaven is also available in ebook and audiobook, and an excerpt can be read online. I’d heard of this one before but wasn’t really familiar with what it was about. Even if the theme of a struggle against an unfair system is common, it’s one I rather like and I’m curious about this one now. From #1 New York Times bestselling author George R. R. Martin and acclaimed author Lisa Tuttle comes a timeless tale that brilliantly renders the struggle between the ironbound world of tradition and a rebellious soul seeking to prove the power of a dream. Among the scattered islands that make up the water world of Windhaven, no one holds more prestige than the silver-winged flyers, romantic figures who cross treacherous oceans, braving shifting winds and sudden storms, to bring news, gossip, songs, and stories to a waiting populace. Maris of Amberly, a fisherman’s daughter, wants nothing more than to soar on the currents high above Windhaven. So she challenges tradition, demanding that flyers be chosen by merit rather than inheritance. But even after winning that bitter battle, Maris finds that her troubles are only beginning. Now a revolution threatens to destroy the world she fought so hard to join—and force her to make the ultimate sacrifice. You guessed it – yet another novel recently released in trade paperback! The Armageddon Rag is also available in ebook format and an excerpt can be read online. The Armageddon Rag sounds like fun and is another one I’m rather excited to read. 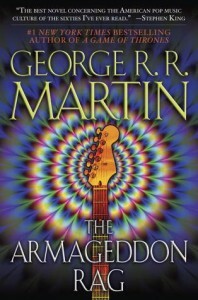 From #1 New York Times bestselling author George R. R. Martin comes the ultimate novel of revolution, rock ’n’ roll, and apocalyptic murder—a stunning work of fiction that portrays not just the end of an era, but the end of the world as we know it. Onetime underground journalist Sandy Blair has come a long way from his radical roots in the ’60s—until something unexpectedly draws him back: the bizarre and brutal murder of a rock promoter who made millions with a band called the Nazgûl. Now, as Sandy sets out to investigate the crime, he finds himself drawn back into his own past—a magical mystery tour of the pent-up passions of his generation. For a new messiah has resurrected the Nazgûl and the mad new rhythm may be more than anyone bargained for—a requiem of demonism, mind control, and death, whose apocalyptic tune only Sandy may be able to change in time . . . before everyone follows the beat. 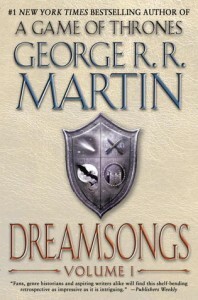 This collection of shorter fiction by George R. R. Martin was recently released in trade paperback. You may also be able to find it in hardcover in some stores, and it is also available as an ebook and audiobook. An excerpt from Dreamsongs: Volume I is available. Dreamsongs is so massive it’s split into two massive volumes (approximately 700 pages each in the trade paperback versions). The first volume starts with an introduction by Gardner Dozois, who often edits anthologies with Martin. The book is split into sections that are introduced with some commentary by Martin. 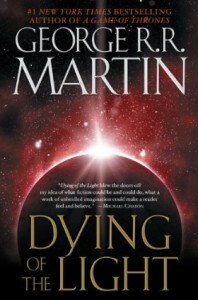 This includes stories such as “A Song for Lya,” for which Martin won his first Hugo Award, and “Sandkings,” a story that won both the Hugo and the Nebula awards. 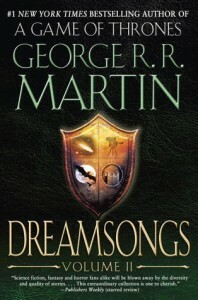 This second half of Dreamsongs was also recently released in trade paperback. 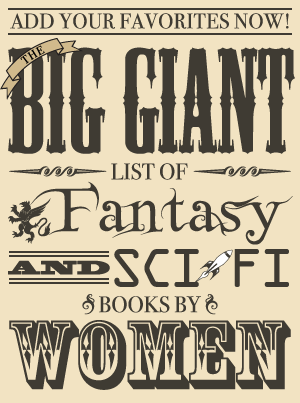 Some stores may have it in hardcover, and it is also available in ebook and audiobook formats. An excerpt is available. This volume includes a couple of screenplays, The Hedge Knight (the first of the novellas set in the same world as A Song of Ice and Fire), and the World Fantasy Award winning story “The Skin Trade.” Like the first volume, it includes commentary by the author. This paranormal romance will be released in paperback, ebook, and audiobook on December 4. It’s supposedly “Indiana Jones ~meets~ Stephanie Plum.” An excerpt can be found on the Mysteries and Margaritas blog. There is currently a giveaway on Goodreads for a copy of Guardians of Stone. It’s open to those in the US, Canada, Australia, and Great Britain through November 17. 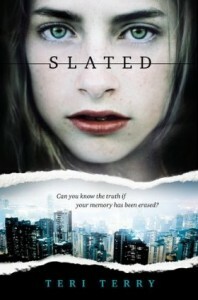 This young adult dystopia will be released in hardcover and ebook in the US and Canada in January 2013. The first two chapters can be read here. It’s the first book in a trilogy. The second book, Fractured, will be available in May 2013 in the UK and Australia, and it should also be out later in 2013 in the US and Canada. For more information, here’s an interview with the author that discusses the series and release dates. This second book in the prequel series to the Nightshade series is a direct sequel to Rift. It will be released in hardcover and ebook on January 8. 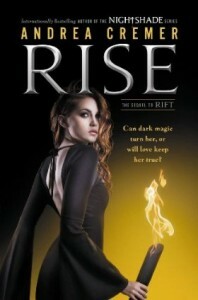 The first two chapters from Rise can be read here.